Solera at Kern Canyon by Del Webb is an active adult community located in Bakersfield, California. This gated community is surrounded by green rolling hills situated at the base of the canyons. Sidewalks and plenty of streetlights make this community very pedestrian friendly. This 55 and over community is one of the lowest priced of all Del Webb communities in California, which makes it affordable for almost everyone. Within the immediate area surrounding this community in Bakersfield there is plenty of shopping, restaurants, and medical facilities. Kern River is nearby as well, which offers an array of water-related activities. Equestrian trails, picnic areas, and a wildlife habitat are in the same area as well. This 55+ community is directly across the street from Rio Bravo Country Club, which offers discounted membership to Solera residents. The 8,000 square-foot Grove Clubhouse in Del Webb Bakersfield is sized just right to fit this intimate 558-home community. The Grove Clubhouse features a welcoming fire place, sharing library, computer niches, arts and crafts room, billiards, and a ballroom. The fully equipped fitness center offers yoga, pilates, and Tai Chi or residents can simply follow their own workout routine. Outdoors, residents can go for a swim in the heated pool or relax in the spa. Tennis and bocce ball courts invite some friendly competition, and golfers can practice their short game at the putting green. A lot of open parks are located throughout the community. Benches are scattered throughout, so residents can enjoy leisurely nature walks, while admiring the Sierra Nevada range in the distance. Construction started in 2004 and now consists of 558 single-family homes. Houses are available on a resale basis. All are ranch style with vinyl fencing in the backyards, with two different collections available. There are eight spacious floor plans to choose from. The Classic Series ranges in sizes from 1,294 to 1,652 square feet and offers two bedrooms, two bathrooms, and an attached two-car garage. The Premier Series ranges in sizes from 1,865 to 2,374 square feet. These homes offer two to three bedrooms, two to two-and-a-half bathrooms, and an attached two-car garage. 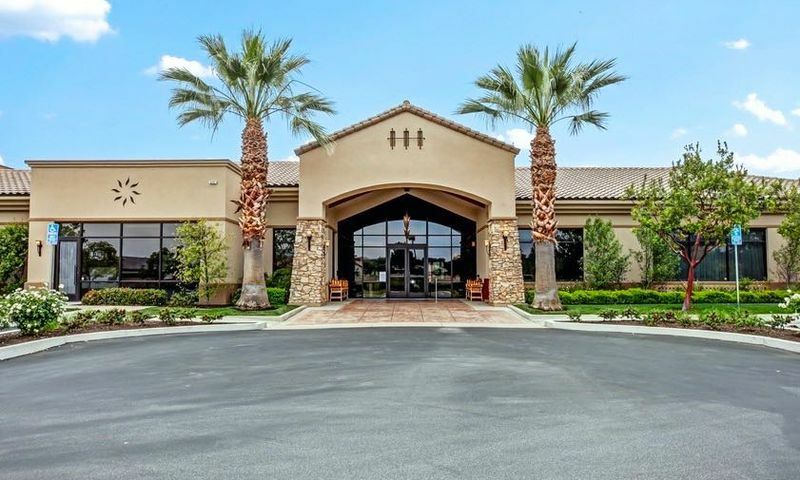 Del Webb's Solera at Kern Canyon is a friendly community with a full-time activities director who schedules activities and events, and supports and helps organize clubs and classes. Some of the clubs and classes include art, book, bridge, computer, crafts and chat, cribbage, drama, fun and games, gardening, golf, Jazzercise, motorcycle group, pilates, reading, scrap booking, sewing and quilting, bocce, tai chi, tennis, Wii Bowling League, Yoga and more. Residents at Del Webb in Bakersfield, California also enjoy volunteering in the local community. This active adult community is located in desirable Bakersfield, California. Bakersfield is a high growth area and it offers numerous attractions and amenities. The nearby Riverwalk is an outdoor collection of shops and restaurants. There are also minor league baseball and hockey teams. Bakersfield also features miles of outdoor biking and hiking trails, and it has 72 city parks. There are plenty of regional parks in Kern County, and seven State and National Parks and Forests. Nearby Lake Kern offers fishing lakes, equestrian trails, picnic areas, and a wildlife habitat. There are also abundant hiking, camping, rock climbing, fishing, and rafting opportunities at the southern end of the Sierra Nevada range. For those who want to venture further to bigger cities, I-5, CA99 and Amtrak provide easy transportation to Los Angeles and San Francisco. Solera at Kern Canyon offers and abundance of activities near and far in Central California. The Grove Clubhouse - 8,000 Sq. Ft. There are plenty of activities available in Solera at Kern Canyon. Here is a sample of some of the clubs, activities and classes offered here. The Classic Series homes in Solera Kern Canyon are ideal for homebuyers who want to enjoy the Del Webb lifestyle on a modest budget. These comfortable homes feature open layouts that give the home a very spacious, airy feel. Homes in the Classic Series range in size from 1,294 to 1,652 square feet and feature two bedrooms, two bathrooms, and a two-car garage. For homeowners who love to entertain and want more space, the Premier Series is the ideal fit. With open layouts, extra bedrooms and two-and-a-half or three car garages, the Premier homes are perfect for those who want the finest Solera at Kern Canyon has to offer. Homes in this series range in size from 1,865 to 2,374 square feet and feature two to three bedrooms and two to two-and-a-half bathrooms. You will love the backyard of this home. They have planted beautiful shade trees and other plants that would give you many enjoyable cool days. You need to see it for yourself! Nothing is perfect, BUT, I really like this community. It is well maintained, the other residents are very friendly. The staff at the clubhouse (The Grove) are very nice and helpful. This area (east of Bakersfield) is quite nice. Kern Canyon is just up the road and a really good area for hiking. Bakersfield itself isn't all that great, but we rarely have to go all the way in to town. The only real downside is shopping and dining out is a bit of a hike. The closest real grocery store is about 10 miles, but I think that will improve as the east end build up more. Friendly neighbors, reasonably priced homes and nice amenities. Always plenty of things going on and activities every day. Aside from the community itself there is a lot happening in the Bakersfield area and you'll find everything you need pretty close by. 55places.com is not affiliated with the developer(s) or homeowners association of Solera at Kern Canyon. The information you submit is distributed to a 55places.com Partner Agent, who is a licensed real estate agent. The information regarding Solera at Kern Canyon has not been verified or approved by the developer or homeowners association. Please verify all information prior to purchasing. 55places.com is not responsible for any errors regarding the information displayed on this website.